the relevance to reading of vocabulary and general knowledge. 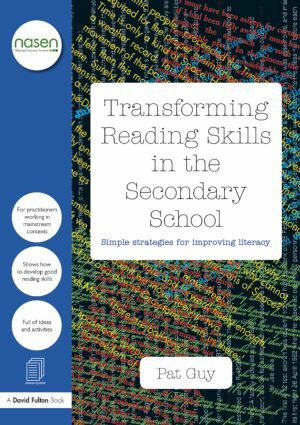 Anyone wanting to develop the reading skills of secondary pupils who struggle will find this a resource they return to time and time again. 1. Practical ways to identify barriers to reading development, with strategies to help students overcome weaknesses in language, concentration and memory. 2. Helping to support the individual in withdrawal lessons: improving comprehension, using assessment tools and training reading mentors. 3. Developing reading skills through mainstream lessons: identifying suitable resources, teaching reading techniques and improving reading speed. 4. Organising whole school reading events, working with parents, carers, librarians and the local community. 5. Stand alone reading lessons for specialist teachers or mainstream staff to use in PHSE, Form Periods or Study Skills sessions. 6. Practical exercises, advice sheets and hand-outs to support staff, parents, carers and students. 7. Pat Guy is an experienced teacher who has taught pupils with reading difficulties in mainstream schools for over twenty-five years.